Nearly all mechanical design is done using the high-end and well-known 3d modeling software ProEngineer. 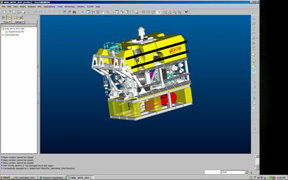 Output from this software can be provided as conventional 2d drawings, files for direct input to computer aided machining, renderings, and many others. Additionally, some two-dimensional work such as schematics are executed in AutoCad. All designs are properly checked and configuration controlled per our client's requirements. 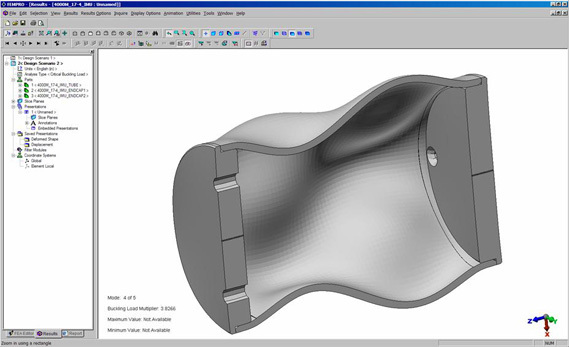 Finite Element Analyses are accomplished on ALGOR, a well-known name in the FEA world. Static Structural, Frames, Buckling, and Heat Transfer are some of the analyses that Okeanos has delivered using this software. This tool, in conjunction with the 3d modeling capabilities and the experience of the design team, allow minimum recursions during an original design process and produces a design which meets the client's requirements and expectations. Project Management and reporting software include the usual Microsoft Office suite of tools - Word, Excel, Powerpoint, as well as Outlook for email. Additionally, MS Project is used for cost and schedule tracking. These tools are also used in creating technical specs and procedures, reports, tradeoff analyses, proposals, requests for quotes, and the like. Quickbooks Pro is used for accounting and cost reporting when required. 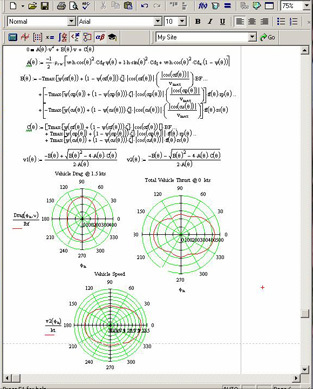 Mechanical and System Dynamic Simulations, as well as mathematically formatted documentation of calculations done during the course of a design are preferentially done on MathCad. Additionally, manual stress calculations, tradeoffs, raw data analysis, trends, and any other calculation can be accomplished, displayed and documented using the software.